O God, who hast left for us the marks of thy passion, in the holy winding sheet in which thy most sacred body was wrapped by Joseph after it was taken down from the cross; mercifully grant that by thy death and burial we may be brought to the glory of thy resurrection. Who liveth and reigneth, world without end. Amen. For meditation, the below narrations are taken from The Passion of Our Lord Jesus Christ, according to the Revelations of Anna Catherine Emmerich. With Ecclesiastical Approbation. Imprimatur. 1914. It was still foggy and dark and gloomy when Joseph of Arimathea and Nicodemus reached the summit, where they were met by the servants whom they had sent on ahead. The holy women sat before the Cross weeping, while Cassius and several soldiers who had been converted stood at some distance silent and reverent. Joseph and Nicodemus narrated to Our Lady and John all they had done to deliver Jesus from an ignominious death, and heard from them in turn how they had, though with difficulty, hindered the breaking of His limbs and thus the prophecy had been fulfilled. They likewise told the story of the lance-thrust of Cassius. Abenadar, too, had now arrived, and sadly and reverently they set about the loving task of taking down from the Cross and preparing for burial the sacred body of their Lord, their Master, their Redeemer. Our Lady and Magdalen sat on the hillock to the right of Our Lord, out towards the cross of Dismas. The other holy women were busy in getting ready the necessary spices, sponges, pieces of cloth and vessels of water. On seeing Abenadar approach, Cassius drew nigh and told his former captain how wonderfully his eyes had been healed. The entire holy company was bathed in a silent atmosphere of sad and earnest tenderness. Now and then, ’tis true, one or the other, without relaxing in vigilance and attention, broke out in burning sighs and lamentations. Magdalen alone had surrendered altogether to grief. Lost in the violence of her emotions she could listen to no suggestion of moderation from anyone. Nicodemus and Joseph planted their ladders against the rear of the Cross, climbed upon them, passed the broad sheet between Our Lord's body and the Cross, wrapped the sheet round the body, and then bound the body firmly to the Cross by three broad straps which were attached to the sheet. In similar manner they passed pieces of cloth between Our Lord's arms and the cross-beams, wrapped the arms round, and bound them firmly to the beams. Hereupon they placed pegs against the points of the nails behind and drove them out in front. Their blows did not shake Our Lord's hands very much, and the nails fell out easily, because the distended body on the one hand had torn the wounds wide open and on the other was now supported, not by the hands, but by the sheets that bound it. The lower part of the body, which had sagged down at the knees when He died, was now in a natural position, supported by a sheet that was fastened to the cross-beams at the nail-holes for the hands. While Joseph was occupied in driving out the left nail and letting the left arm sink in its bandages gently down beside the body, Nicodemus on his side was similarly engaged in binding to the beam both the right arm and the thorn-crowned head, which was sunken down on the right shoulder. Then he, too, drove out the nail on his side, and let also the right arm sink in its bandages gently down beside the body. Meanwhile, with some exertion, Abenadar had driven the large nail up through the feet. As the nails fell to the ground, Cassius took them up reverently, and laid them together at the feet of Our Lady. And now they planted their ladders in front, quite close to the sacred body, climbed up again, unloosed the higher straps from the Cross and hung it over one of the hooks attached to the ladders. In the same way they unloosed the other two straps and fastened them to the hooks on the ladder. They then began the descent, moving the straps one by one to a lower hook and then to a still lower, thus letting the sacred body little by little downwards. The centurion Abenadar, standing on a stool, was supporting Our Lord's body by clasping it beneath the knees, while Joseph and Nicodemus held the upper body between them in their arms. Thus step by step, gently and carefully, as though bearing a severely wounded friend, they slowly descended the ladders and laid the martyred body of the Redeemer on the ground. The whole scene was indescribably sad and beautiful. Every act was marked with caution and tenderness, as though they feared to inflict new pain on His dead body. They showered upon the sacred remains the same love and reverence they had shown to the Most Holy One during His life. Every eye was fixed steadily on the sacred body, its every motion was followed with tears, with spontaneous outstretching of hands that signified support and compassion. But all were still and silent, speaking only when cooperation required it, and then briefly and in subdued tones, like men overpowered by reverence at a sacred ceremony in a temple. The strokes of the hammer in driving out the nails resounded with fresh sorrow in the souls of Our Lady and Magdalen, and of all who had been present at the crucifixion. They could not but recall the fearful nailing to the Cross, and likened again in trembling to His clear, sweet tones of lamentation, and seemed again to be awaiting in sadness His approaching death, though His sacred lips were now silent.—As soon as the sacred body reached the ground, the men wrapped it in linen from the hips to the knees, and laid it into the eager outstretched arms of the Dolorous Mother. Our Lady sat on an outspread coverlet, her back supported by a bundle, which the women seem to have rolled together out of cloaks and mantles, in order to make it somewhat easier for the sorrow-worn Mother to render the last sad service of love to the body of her slaughtered Son. Her right knee was somewhat elevated, and the men laid the body down upon the sheet so as to bring Our Lord's head to rest on His Mother's knee. Our Lady's grief is equalled only by her love, now that she can at last hold once more in her arms, lifeless though it be, that dear body during whose long martyrdom she has had to stand by helpless. Here He is at last, right under her eyes, in all His beautiful desolation. Lovingly, dolorously, her lips touch His bloody cheeks, and slowly from wound to wound her eyes glide tenderly over His lacerated form. In their degree all present shared her grief. Magdalen's face was pressed down on Our Lord's feet. A number of converted soldiers, Cassius at their head, stood reverently at a distance. The other men withdrew to a deeper lying mountain nook, southwest of the summit, to get everything in readiness for embalming the sacred body. All who were ill-disposed to Our Lord had returned into the city, so that those present formed a body-guard round the spot where the last honors were being paid to the sacred remains. While humbly keeping their distance the men were near enough when called upon to render loving service. The holy women surrounded the body somewhat more closely, offering whenever necessary water flasks, sponges, cloths, ointments and spices, then stepping back reverently to continue their loving vigilance. Among them were Mary of Cleophas, Salome and Veronica. Magdalen was constantly occupied with the holy body itself. […] John was constantly at Our Lady's beck and call, and acted as messenger between the women and the men. He assisted in so many different ways, both here with the women, and afterwards with the men. Everything the women needed was ready. I noticed particularly water flasks of leather, which could be opened and laid flat together one on top of another, as also a vessel of water standing over glowing coals. One vessel of pure water after another, one sponge after another, the women offered to Our Lady and Magdalen, receiving back and squeezing into the flasks those already used. Our Lady's indescribable agony did not make her less strong and courageous. Though inundated with sorrow she could not leave that beloved body in such outraged condition, and at once set about her long and loving task. She opened the crown of thorns from behind, and began carefully, with the assistance of her companions, to loosen it from His head. Some of the thorns had pierced into His head, and had first to be cut away from the crown, as otherwise every attempt to loosen the crown would have widened the wounds. They laid the crown to the nails, while Our Lady took a long, elastic, yellow-colored pair of pincers and drew from Our Lord's head all the piercing points and slivers that still remained, holding them up sadly to be gazed upon by her companions. The thorns were laid with the crown, at least most of them, some may have been kept as memorials. Our Lord's face was so bloody and disfigured as to be almost unrecognizable, and His dishevelled hair and beard were clotted with blood. Our Lady washed that pitiful head and face, loosened the congealed blood in His hair with a wet sponge. And ever as she proceeded in her work of love, stood out more clearly His awful martyrdom, ever as she passed from wound to wound grew deeper her compassion, and care, and tenderness. Her right hand holding a sponge and its fingers covered with a piece of cloth, she loosened and washed the blood out of the wounds in His head, out of the death-broken eyes, out of the nostrils, out of the ears. With cloth and index finger she cleansed the half-open mouth, the tongue, the teeth and the lips. She parted His hair between the right side and the back of His head and again between the back and the left side, and on both sides brushed it back smooth behind the ears. Her task of cleansing concluded, she kissed His cheek and covered His head. And now her tender fingers wandered on over His neck, shoulders, breast and back, along His arms and down to His blood-stained, lacerated hands. Oh, God, more shuddering than ever is now the desolation of ruin wreaked upon that beautiful frame! Behold that chest with its distended and distorted bones and joints! That shoulder with its deep-ploughed wound! That breast and back and arms harrowed with scourges and stripes! That little tell-tale wound above His heart to the left, and to the right below that awful gap where the heart-cleaving lance found entrance! On from one to the other glided the cleansing compassionate fingers. Magdalen sometimes stood in front of Our Lady to render aid, but generally lay prostrate at the feet of Jesus, washing them for the last time rather with her tears than with water, and wiping them with her hair. Our Lord's head, breast, waist, and limbs were now free from blood and filth, and the holy body lay peacefully in Mary's lap. His bloodless flesh shining bluish white in color, except clotted stripes streaked in brown, or raw-peeled patches tinged it red. Tenderly Our Lady now covered His sacred limbs, and began to anoint His body wound by wound as before. The holy women knelt in succession before her, holding open for her a little box filled with ointment or some similar precious substance. Out of this box Our Lady kept the thumb and fore-finger of her right hand constanly moistened till she had anointed all His wounds. How beautiful to see her take Our Lord's hands into her own left hand, kiss them reverently, and fill those gaping wounds with spicy ointment. The openings in His ears. His nostrils, the lance-wound in His side—all claimed in turn her loving ministrations.—Magdalen's service was given almost exclusively to Our Lord's sacred feet. Now she dried and anointed them, then moistened them again with her tears, often lying prostrate for long at a time with her face resting on them. I saw that they did not throw away the water when used but poured it into the leathern flasks. Oft-times I saw Cassius or some other soldier take the flasks or jars which the women had brought, and go to the well in Gihon to get fresh water. This well was quite near, so near that it could be seen from the Garden of the Sepulchre. Our Lady Closes Our Lord's Half-broken Eyes. After anointing all Our Lord's wounds, Our Lady swathed His head, but did not as yet draw down the ligatures over His face. Gently she pressed down the lids over those half-broken eyes, letting her hand rest softly on them for a while. Then she closed His mouth, embraced His sacred body, and let her weeping face sink sadly down upon His. Magdalen's reverence would not let her touch the face of Jesus, her own face rested on His holy feet. Joseph and Nicodemus had already been waiting for some time, and John now drew near Our Lady to beg her to give the precious body over to them so they might have it embalmed before the Sabbath commenced. Once more, still more tenderly and lovingly, Our Lady embraced the martyred body and spoke touching words of farewell. 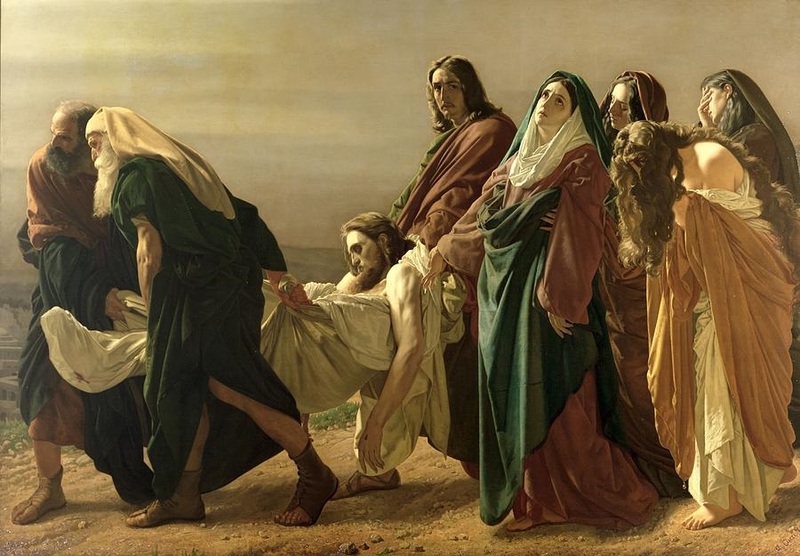 Then by means of the sheet on which it lay the men lifted the body of Jesus out of the lap of His Mother and carried it down to the spot chosen for embalming. Our Lady, who had felt some alleviation of agony in caring for and caressing those beloved remains, now sank back into the depths of sorrow and lay with muffled head resting in the arms of her companions. Magdalen, like one being robbed of her beloved, followed with outstretched arms the men who were bearing Our Lord away, but turned after a few steps and came back to Our Lady. When the sacred body had been embalmed, John led Our Lady and the holy women to the spot. Our Lady knelt down at Our Savior's head, took from round her neck beneath her mantle a fine piece of linen, presented to her by Claudia Procles, and laid it under Our Lord's head. With her companions she piled the entire space between head and shoulders and round up to the cheeks with aromatic herbs, filling in all crevices with delicate fibers and fine powder, then wrapped the underlying fine piece of linen round head and shoulders so that they were imbedded in this sweet-scented cushion. Magdalen poured a full flask of fragrant perfume into the wound in the side, and the other holy women put aromatic herbs into the hands and round and beneath His feet. Then with sweet spices the men filled in the arm-pits, overlaid the cavity about the heart, and rounded out every depression of the entire body. Hereupon they crossed the stiffened arms upon the bosom, and fastened the fragrant layers of spices and perfume by wrapping the large white sheet firmly round the body as high as the breast, just as one would swathe a child. Then they laid the body upon the six-cubits long sheet, bought by Joseph, folded one of the lower ends up over the breast, one of the upper ends down over head and shoulders, and wrapped the two sides inwards round the body. While they knelt thus round the body, weeping and saying farewell, a most touching miracle took place before their eyes. On the outer surface of the sheet that covered it there appeared, reddish-brown in color, the entire figure of the body with all its wounds as if Our Lord was anxious to show His gratitude for their loving care and compassion by letting His picture shine out to them through all its wrappings. Weeping and lamenting they embraced the sacred body and kissed with reverence that wonderful impression. Astonishment made them unwrap the outer sheet once more, and that astonishment grew still deeper when they found all other wrappings as white as ever, and only the outer sheet marked with Our Lord’s figure. Upon the sheet below where Our Lord lay were imprinted the full outlines of His back, while the form of His body in front stood out above. But as here in front several different corners and edges overlay one another, the sheet, in order to show Our Lord’s figure, had to be folded just as it had been when wrapped round the body. This picture did not arise naturally from contact with Our Lord's wounds, since these were deeply imbedded in spices and thickly wrapped in bandages. It was a miraculous impression created by the Godhead which remained hypostatically united even to the dead body of the Savior. Taken from: The Passion of Our Lord Jesus Christ, according to the Revelations of Anna Catherine Emmerich. Aaron entering into the tabernacle to offer a holocaust on the altar for the sins of the children of Israel was clothed with a linen tunic.